Posted on April 24, 2014 by revivewa	in From the mod, Opinion and tagged I think therefore I am. 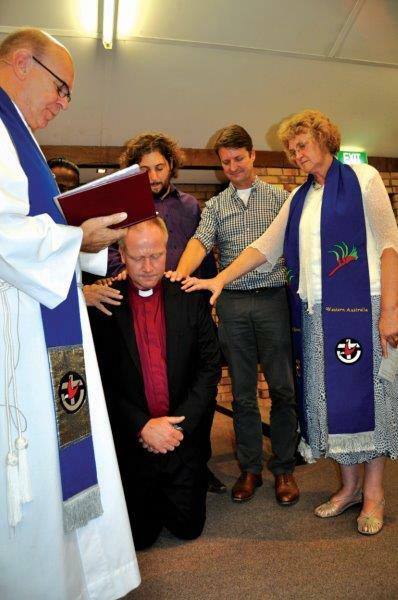 The Induction of Rev Nich Cole and the Commissioning of Richard Telfer at Trinity North Uniting Church. There is an old joke that goes: Rene Descartes went into his local for a drink. When he had finished his first drink the bartender said, “Mr Descartes would you like another?” To which Rene replied “I don’t think…” and disappeared! To understand the joke you need to know that Rene Descartes, the 17th century French philosopher and mathematician, often regarded as the father of modern philosophy, coined the phrase ‘I think, therefore I am’ (Cogito ergo sum). You are probably familiar with Descartes’ other great contribution in the field of geometry, even if you are unaware, because every time you see a graph with an x-y axis you are seeing Descartes work, as he invented the Cartesian representation that you see. “I think, therefore I am” is an interesting concept in our time, given that most of modern science would say “I am, therefore I think”. That is to say we are all merely a product of physics and chemistry and chance and time. That our consciousness is a product of evolution and based on chance in a chaotic universe, which is the complete reverse of Descartes’ belief that consciousness was at the heart of being. So, I was interested to read recently that there is a new thought that is gaining ground in physics that suggests something entirely different, that in fact consciousness came first. That consciousness created all that is; the entire universe. That consciousness created both time and space and that all consciousness could be eternal and connected. Some would say that his explains the sort of near death out of body experience that seems very real, that the conscious self is indeed outside of the body. This seems to link for me to the sort of power of thought to create so evident in Jesus’ ministry. I believe that Jesus imagined a different world, a world he called the Kingdom or Reign or Rule of God. What New Testament scholar Prof John Dominic Crossan refers to as “what the world would look like if God was in charge”. A world Jesus imaged in his teachings, in his actions and in his living and dying. I believe that all of the teachings and actions of Jesus taken in their entirety add up to an imagined new world that Jesus sought to live into being. To create this new world we must also think it into being, imagine it into being if you like. Because it can only be created if we imagine it first and, for us followers of Jesus, imagine it as Jesus did. “I think, therefore I am”, consciousness created time and space, Jesus imagined the Reign of God in the world, you and I can imagine the same Reign of God in our world and in the Spirit let it break in day after day, in our lives and the lives of others near and far. My prayer for us is we re-imagine with Jesus the Reign of God in our world and live it into being. I imagine with Christ, therefore I am a Christian.